After A Year Of Rising Tensions, Protesters Tear Down Confederate Statue On UNC Campus A crowd of about 250 students, faculty and residents stormed the bronze sculpture of a Confederate soldier, using ropes to yank it from its century-old pedestal. Police stand guard after the Confederate statue known as "Silent Sam" was toppled by protesters on campus at the University of North Carolina in Chapel Hill, N.C., on Monday. Demonstrators gathered at the University of North Carolina, Chapel Hill campus Monday night achieved a decades-long goal for those opposed to public displays of Confederate statues: They toppled "Silent Sam," a monument dedicated to fallen Civil War-era soldiers. A crowd of about 250 students, faculty and local residents carrying banners that condemned white supremacy stormed the bronze sculpture and, using ropes, brought it crashing down from its century-old pedestal. It was the culmination of a protest that began earlier in the evening, on the eve of the first day of classes. "I feel liberated — like I'm a part of something big. It's literally my fourth day here," first-year Natalia Walker told The Daily Tar Heel. "This is the biggest thing I've ever been a part of in my life." Dwayne Dixon, a teaching assistant professor of Asian studies, told the paper, "I watched it groan and shiver and come asunder." "I mean, it feels biblical. It's thundering and starting to rain. It's almost like heaven is trying to wash away the soiled, contaminated remains," Dixon said. Bystanders, some wearing T-shirts emblazoned with Confederate flags, watched the protest, The News & Observer reports. According to the newspaper, "Clint Procell, 31, wore a Trump hat. A self-described conservative, Procell said he wanted to see for himself how intolerant the people protesting Silent Sam were, and the experience didn't disappoint. He said he was pushed and his hat was temporarily stolen." "The main reason for me to come was to see the people fighting against [President] Trump," Procell told The News & Observer. 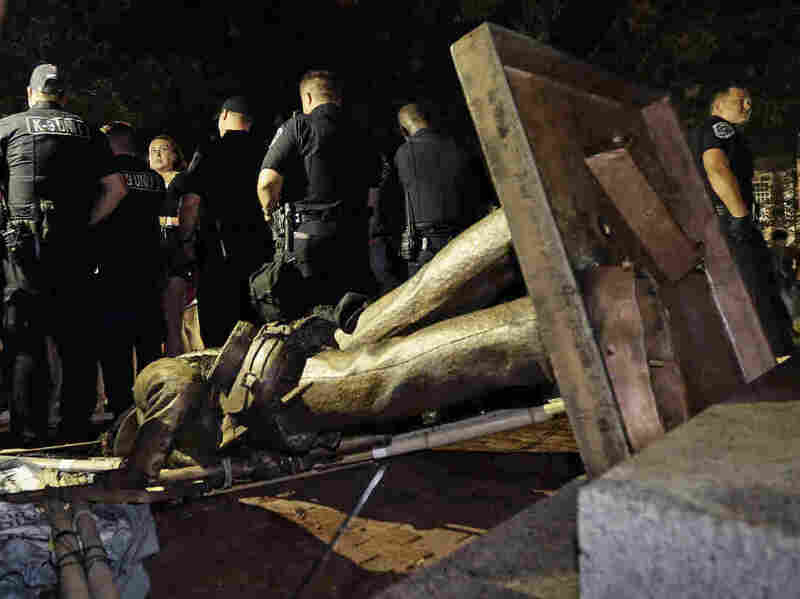 An NBC video showed protesters erupting into jubilant cheers after the statue hit the ground. Some gathered around, taking turns kicking the felled figure and trying to cover it with dirt. Silent Sam has been a source of controversy for more than 50 years, and the battle over its presence — facing north and towering in the university's upper quad — has only intensified. Calls for its removal grew louder following the deadly white supremacist rally in Charlottesville, Va., last August. However, university officials have maintained that a state law designed to protect a "monument, memorial or work of art owned by the state" prohibited the removal of the divisive symbol. In the past year, the university spent $390,000 on security for the statue, according to The News & Observer. The statue was erected in 1913 after being commissioned by the Daughters of the Confederacy to honor the young men who quit their studies to march off to fight in the Civil War. Following Monday's incident, UNC Chancellor Carol Folt issued a statement, acknowledging that "the monument has been divisive for years, and its presence has been a source of frustration for many people." But she condemned the protesters' "unlawful and dangerous" actions. Folt said police are "investigating the vandalism and assessing the full extent of the damage." North Carolina Gov. Roy Cooper's office also weighed in on Twitter, writing: "The Governor understands that many people are frustrated by the pace of change and he shares their frustration, but violent destruction of public property has no place in our communities." The Tar Heel reported that the demise of the statue was preceded by a rally supporting UNC doctoral student Maya Little, who faces honor court and criminal charges for defacing the monument with her own blood and red paint this past spring. In a speech before the statue came down, Little told the crowd that it was time to remove the controversial emblem of what she said is white supremacy. "It's time to build monuments to honor those who have been murdered by white supremacy," Little said. "It's time to tear down Silent Sam. It's time to tear down UNC's institutional white supremacy." Hours after it was knocked off its prominent stand, the crumpled carcass of the statue was placed into a truck and hauled away to an undisclosed location.